Access to the past would open all sorts of new possibilities of more than travel. (ISNS) -- Time travel is often a way to change history in science fiction such as "Back to the Future" and "Looper." Now researchers suggest a certain kind of time machine could also possess another powerful capability — cloning perfect copies of anything. We are all time travelers in that we all move forward in time. However, scientists have suggested it might be possible to move back in time by manipulating the fabric of space and time in our cosmos. All mass distorts space-time, causing the experience of gravity, a bit like how a ball sitting on a rubber sheet would make nearby balls on the sheet roll toward it. 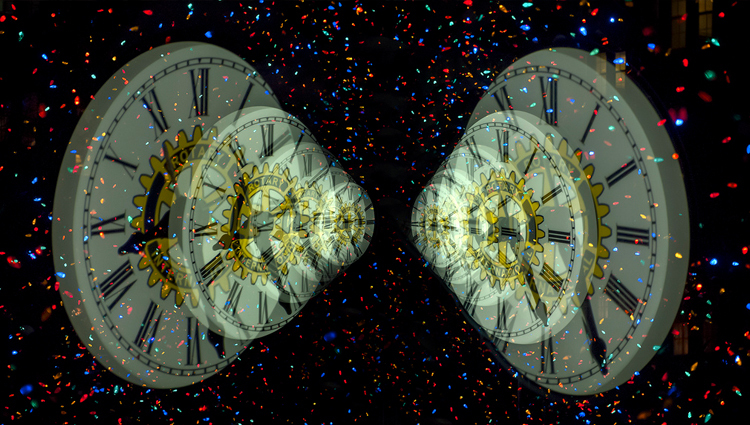 Physicists have proposed time machines that could bend the fabric of space and time so much that timelines actually turn back on themselves, forming loops technically known as "closed timelike curves." These space-time warps can develop because of wormholes — tunnels that can in theory allow travel anywhere in space and time, or even into another universe. Wormholes are allowed by Einstein's general theory of relativity, although whether they are practically possible is another matter. In classical physics, one can generate a perfect copy of anything by finding out every detail about it and arranging the same components in the same order. However, in the bizarre world of quantum physics — the best description so far of how reality behaves on its most fundamental levels — one cannot perfectly measure every detail of an object at once. This is related to Heisenberg's uncertainty principle, which notes that one can perfectly measure either the position or the momentum of a particle, but not both with unlimited accuracy. Nearly 25 years ago, theoretical physicist David Deutsch at the University of Oxford in England suggested closed timelike curves might actually violate the no-cloning theorem, allowing perfect copies to be constructed of anything. Now scientists reveal this might be true in findings detailed in the Nov. 8 issue of the journal Physical Review Letters. "It's like there are 1,000 different particles emerging from all the wormholes, but in fact they're all the same particle you sent in the beginning," Wilde said. "You just have all these temporary copies emerging from and going back into these wormholes." The accuracy of the facsimile one can make of an object traveling in a time machine is related to the number of the time machine's wormholes one has access to from different points in time. The more wormholes one has access to, the more temporary copies of that object one can take from the time machine for analysis. With enough temporary copies of the object, one can make as many perfect facsimiles of it outside the time machine as desired. However, these findings might not suggest time machines can violate the no-cloning theorem. Instead, this could mean closed timelike curves according to Deutsch's model are not possible, Wilde said. Closed timelike curves that behave according to other models do not violate the no-cloning theorem and would not allow perfect copies to be made, Wilde noted. "To me, all these results simply give us additional indications of how hard it is to fit closed timelike curves into everything else we know and believe about the laws of physics," theoretical computer scientist Scott Aaronson at MIT, who did not take part in this research. "My guess would be that they're hinting to us that closed timelike curves should not be physically possible."